Professor Steve Easterbrook has been appointed as Director of the School of the Environment for a three-and-a-half year term from January 1, 2019 to June 30, 2022. Professor Easterbrook received his PhD in Computer Science from Imperial College, University of London in 1991. He was appointed as Lecturer in Computing and Artificial Intelligence at the University of Sussex in 1990 and received tenure there in 1993. In 1995, he was appointed Lead Scientist at the NASA Software Verification and Validation Lab in Fairmont, West Virginia, and a Research Associate Professor at West Virginia University from 1997. 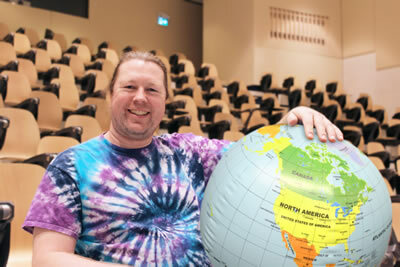 He joined the University of Toronto in 1999 as Associate Professor in the Department of Computer Science, with promotion to Full Professor in 2005. In 2010, he joined the School of the Environment as a Graduate Faculty Member. Professor Easterbrook’s early research focused on decision-making and coordination in large software development teams, along with techniques for ensuring software safety and reliability, and he has applied this work to a variety of software systems, including the flight software for the Space Shuttle and International Space Station. In 2007 he began an ongoing analysis of how global climate models are developed and tested, and is currently writing a book explaining, for a general audience, how scientists work with these models. His current research explores the role of computer science in bringing about a sustainable post-carbon future, including the trade-off between the environmental footprint of digital technology versus the potential of that technology to reduce the environmental burden of other human activities. He is also examining the role of computational models in teaching key concepts of climate science and the application of web-based collective intelligence tools to create consensus solutions to climate change. Professor Easterbrook is a passionate educator, and has developed and taught a number of innovative new courses related to computing and the environment. In 2013, he was part of a team that launched a Big Ideas course entitled “The Internet: Saving Civilization or Trashing the Planet?”, which explored the impact of the internet from a variety of disciplinary perspectives. This course evolved into two new courses in the School of Environment in 2016: “Social Media and Environmentalism”, which is run by Professor Easterbrook, and “Is the Internet Green?” to which he regularly contributes lectures. Professor Easterbrook also regularly teaches an interdisciplinary graduate course on System Thinking, which uses a variety of classroom games and hands on activities to explore the dynamics of complex systems. In the last few years he has also taught courses on climate literacy, and academic leadership in computer science. Professor Easterbrook currently holds numerous research grants from CFI, UK SPSRC, Ionada Incorporated, ORF and NSERC totalling approximately $10.6 million. He has been a member of the editorial board of Geoscientific Model Development since 2010 and has previously served as a member of the editorial boards of Requirements Engineering Journal and Journal of Automated Software Engineering among other editorial responsibilities over the course of his career. He has been actively involved in organizing international conferences, most recently as the General Chair of the Fifth International Conference on ICT for Sustainability, held in Toronto in May, 2018. His previous administrative experience at the University of Toronto includes having served as Academic Director of Bell University Labs (2004-2008) and Associate Director of Knowledge, Media, Design Institute (2003-2005), in addition to service on a variety of faculty search and advisory committees at the University. Congratulations to Professor Easterbrook on his new position in the School of the Environment!